Ever find it difficult to make the most of Library lessons? This complete scheme with individual lesson plans and all resources will assist teachers (including non-specialists) when teaching lessons in the Library. They can be supplemented with silent reading so each lesson is designed to last 30-40 minutes. It also incorporates IT skills and both target setting, reflection, and review (including a final assessment). Resources to support students understanding PEE and how to write about a text. Using Charge of the Light Brigade, Of Mice and Men and Mametz Wood. KS3 Library lesson resource pack - make Library time count! Covers a range of genres and allows students time in the library to explore the texts they may enjoy. Encourages engagement in the Library but also gives younger students a grounding in the genres they may enjoy and want to explore further. Great for non-specialist teachers, about 6 lessons worth of activities here. Perfect for Y7 students, this mini assessment with brilliant guidance in the form of a cloze style will support previously low attainers. This bundle of resources provides a differentiated guide to writing about a text using PEE, it is focussed on Macbeth but great as an example for any text. Could be blown up to make a display too. Each sheet has both the model (how to) but also exemplar / model material to make this clear. Useful template for students to use when writing newspaper articles. Useful to model what Grade 5 and 9 may look like and help students to self and peer assess. Save time giving feedback to students in reference to 8700/1 and 8700/2 Specimen Paper 1. Students in Year 8 or Year 9 would love these activities to stretch and challenge them to the top grades. There is also a useful paragraph model included which is great for a comparative essay between Daisy (Gatsby) and Curley's Wife. This model is Grade 6/7 in order to allow students to improve it as an activity. Commonly Misspelt Words LARGE print, perfect for a common errors display! All the commonly misspelt words, enlarged and ready to print. Perfect to print one copy onto A4 then enlarge to A3, it is then really easy for students to see and check from anywhere in the classroom. Empower students and teachers not to make these common errors! Helpful for students to aid understanding of the novel. Could be used in Y9 as a preparation for GCSE style assessment. Contains multiple activities, extracts from the book, with sample essay questions at the back. Perfect also for a non-specialist, or a holiday / self directed homework. Perfect for the new GCSE specification, this revision guide gives students a structured set of tasks, with preceding information which guides them. Enough for at least 5 hours homework if not more. Perfect for an ongoing half termly homework or a holiday project. Connectives resources - differentiated and great for an interview lesson! Connectives (linking words) are useful as part of VCOP to support students in improving writing. These resources are perfect for a skills lesson or for a short interview lesson (20 minutes). There is a teacher copy in case of non-specialists using this as a cover lesson. There are multiple copies of the sheet to help show differentiation by task. This single lesson supports students' understanding of adverbs, with a PPT to guide them through and a worksheet. Perfect for a non-specialist teacher or a new teacher who wants to work explicitly on grammar. Great for Y9 students who will study Lord of the Flies as part of the new GCSE specification. They can study both texts and then do this assessment to compare them. 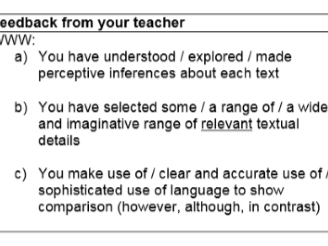 This cross-references with the comparative language questions too, thus, preparing them for both Lang and Lit.